The opener's safety sensors are basically the system's "eyes". They are usually positioned at the bottom of the door on either side. Since the 90s, government regulations have come to dictate that it is mandatory that every type of garage door opener possess this safety feature. 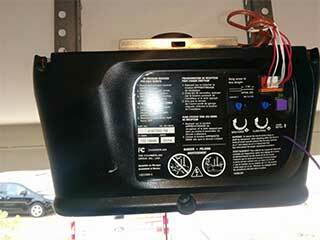 That being said, some homeowners have not replaced their garage door opener in decades. If you are one of them, there is a high chance that your opener is lacking these crucial components. Furthermore, even if your system does possess them, the delicate nature of these sensors makes them susceptible to various types of malfunctions. Whether it's dirty or scratched lenses or misalignment issues, you should seek professional assistance whenever you detect a problem. An opener's receiver box that is designed to receive and process signals transmitted by the system's remote control. If the receiver malfunctions, the signal will not get processed correctly and the door will fail to open or close appropriately. It is inadvisable that you to try to handle this type of issue by yourself. The receiver box is fairly complex, and rather than potentially causing it more damages, you should get the problem resolved by a professional technician with the right tools and expertise to do the job. Whether it's caused by a sudden power surge or simply due to the inevitable decline of old age, a burnt electrical component, however small, will render your entire system completely inoperable. Unless you are a trained electrician with plenty of years' worth of experience in dealing with garage door openers and their various components, it's best that you leave these types of problems to a professional service provider. That's where we come in. Our team at Garage Door Repair Atlanta is highly skilled in helping homeowners deal with every type of opener related issue. Be sure to call us whenever the need arises.